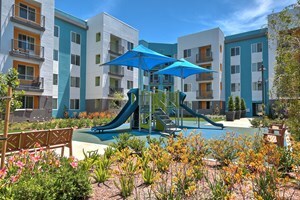 San Jose, Calif.—By month’s end, ROEM is expected to complete its development of 200 new affordable rental homes at the $46 million Charlotte Park Apartments in San Jose, Calif. The units are 100 percent leased. The new housing is located on the former Hitachi Global Storage Technologies campus, near the intersection of Cottle Road and Highway 85, within steps of the Blossom Hill Caltrain station and the Cottle and Santa Teresa light rail stations. Charlotte Park is part of a 295-acre master-planned community to feature condominiums, apartments and attached townhomes. Also included in the development are numerous pocket parks and a 10-acre park with a baseball field. ROEM Corporation satisfied most of the affordable housing requirements of the Hitachi master-planned community. ROEM Builders Inc., acted as general contractor and construction manager. The housing is affordable to families that earn 60 percent or less of the Santa Clara County Area Median Income. Among the amenities of the four-story apartment building are a courtyard with large outdoor barbecue, dining area, tot lot and lounge area, community room with media alcove, kitchen and entertainment area, storage area, homework and computer room and laundry facilities. Apartments feature Energy Star refrigerators and dishwashers, blinds, carpet, coat closets, and electrical four-burner stove-ovens. Charlotte Park will pursue USGBC LEED Gold certification. Both solar thermal heating and solar photovoltaic power sources are being installed, giving Charlotte Park the potential to save up to 85 percent on utility bills when compared to electric water heating. In keeping with LEED standards, all apartments have high-efficiency flush toilets and faucets as well as thermostatically-controlled “Evolve Roadrunner” shower heads. Charlotte Park also integrates efficient landscape design by using native species and zero turf on a lot designed to capture and treat all storm water. Sanchez added that 430 of the company’s more than 3,000 new affordable housing units completed since 2000 were built by ROEM for a market-rate developer. Construction and permanent financing were provided by Citi.